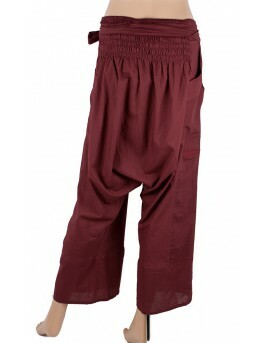 Loose fitting Thai style trousers made of 100% cotton. Theses baggy trousers are worn low on the hips and will make any hippie feel comfortable, as they are perfect for yoga, meditation or travelling. They have four pockets, two on each side; two are with zip for extra security. They are elasticated at the back and two long strings ensure you can adjust the waist to your size. 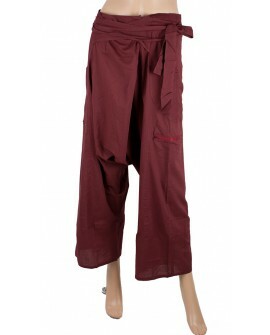 These trousers are also unisex and would be great for festivals. 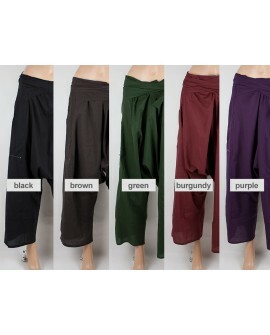 This pants will fit you if your size is in between UK 10-16 | AU 10-16 | US 6-12 | EU 38-44.